Can't I Just Strengthen My Grip? Players that struggle with an open clubface and a "flip" or "scoop" release will sometimes ask, "Why should I train the "motorcycle" if I can just strengthen my grip?" While the "motorcycle" pattern (shaft rotation) may feel a bit uncomfortable at first, especially for those who are used to playing with an open face, it requires less compensation later on. That is, the "motorcycle" closes the face AND moves the low point forward. On the other hand, strengthening your grip simply closes the face and may exacerbate an already inefficient low-point pattern. Typically, players who rely on a stronger grip will have to default to an excessive in-to-out path or an over-rotation of the body, both of which can hurt consistency and accuracy. Connecting Leg & Arm Extension Learn how to connect the upper & lower body for a better release. Why Start With The Motorcycle When you have a few things to work on, shaft rotation may be a great starting point. Playing With Low Point When you build the skill of controlling low point, you're able to adjust to the varying lies on the course. Grip Strength to Sternum Helping you understand and visualize the connection between the grip and impact. Factors of Low Point There is more to controlling low point than just the left shoulder location. 5 Degree Grip Changes Learn the power of fine tuning the position of your hands on the club and how it affects ball flight. 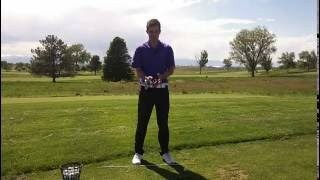 How To Grip The Club - Full Swing How to make sure the grip is in the right location and the right strength for what shot you want to hit.